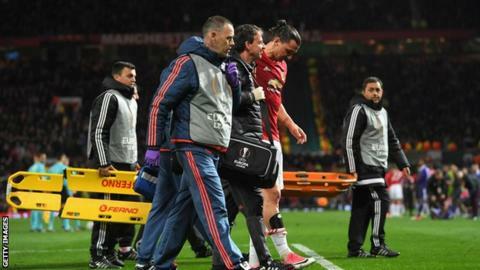 Manchester United top scorer Zlatan Ibrahimovic and defender Marcos Rojo suffered suspected knee injuries in the Europa League win over Anderlecht. Ibrahimovic, 35, landed awkwardly when challenging for the ball, while Rojo, 27, was replaced on 23 minutes after colliding with a visiting player. Boss Jose Mourinho said the early news on the injuries is "fairly negative". He added: "I want to wait but my feeling is not good for both. I want to wait and be optimistic but I am not." Ibrahimovic, who has scored 28 goals this season since his free transfer from Paris St-Germain in the summer, is yet to agree an extension on his one-year United deal. Rojo's injury means he joins fellow defenders Chris Smalling and Phil Jones on United's injury list. Against Anderlecht, Daley Blind played the remainder of the game in place of the Argentine and may keep his place alongside centre-back Eric Bailly for Sunday's Premier league trip to Burnley (kick-off 14:15 BST). Smalling has a knee injury sustained on England duty while Jones suffered a foot problem in a tackle with Smalling in training before England's friendly against Germany in Dusseldorf last month. Mourinho added: "They have to be brave now. If it was me, it [returning from injury] would be tomorrow. "It is time for Jones and Smalling to be brave, to risk, because for the team we have to do everything. That is the way we think. "We cannot do miracles. Miracles I don't expect - but you have to try to do everything to accelerate the process. "They cannot make miracles. They are injured and they cannot make Sunday. "They cannot do miracles but with a special spirit, instead of coming back mid-May you can come back at the beginning of May. They could accelerate the process." Jose Mourinho has won his past nine European home games as manager, including all six with Man Utd this season. Man Utd are unbeaten in their past 26 games in all competitions at Old Trafford (W17 D9); their longest unbeaten run since October 2011 (37 games). Anderlecht have never won in 18 previous away games against English sides (D2 L16), conceding in every contest. Henrikh Mkhitaryan has scored in five of his past six Europa League games. Mkhitaryan has scored in three successive appearances (all comps) for Man Utd for the second time this season. Only Genk (25) and Roma (24) have scored more goals in the Europa League this season than Anderlecht (23). Manchester United switch their focus back to the Premier League as they travel to Burnley on Sunday (14:15 BST) before travelling to Manchester City on 27 April (20:00).